Nanjing is one of the last cities on the Yangtze River and capital of the Jiangsu province. Its population is a large 5.2 million and counting and acts as the capital of southern China. The city today is a multiple force on the economy, producing many industrial goods used throughout the country and for exportation to the world. It is also a vital transportation hub and communication center, not to mention one of the 4 major scientific research and educational cities in China. Nanjing continues to grow economically in double digit percentages every year, leaving its mark on the nation in many ways. Still, Nanjing is a city of much cultural heritage to explore and learn even if it is a modern hub these days. It was one of the 4 ancient capitals of China during the Six Dynasties and Wu Kingdom period into the Ming Dynasty (though it changed names and shapes in the meantime), a and capital of the nation before the Chinese Civil War with Taiwan. The city enjoys 4 seasons including a monsoon period every year. Nanjing is frost-free about 237 days out of the year and has an average annual temperature of 16 degrees Celsius. Summers are very hot and humid while winters are cold and damp. Temperatures in the summer remain high without much reprieve. Nanjing is very accessible and it can be easily reached by flight, train, bus and boat. Nanjing Lukou International Airport serves routes from major cities in China as well as to Japan, Korea, Malaysia, Singapore, and beyond. 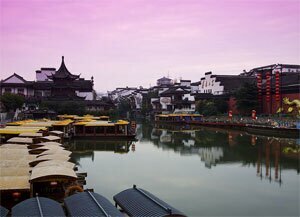 It is about 35 kilometers from Nanjing center and well serviced by shuttles and other public transportation. You can take a taxi to the airport, or one of 2 express bus routes that link the airport with Zhonghuamen or Hanzhongmen. As part of the Shanghai-Beijing rail line, Nanjing is an important stop for many travelers. There are 3 main train stations where you can make connections to other cities branching off of Nanjing. The main one is Nanjing Station also known as Nanjing North on the north shore of Xuanwu Lake and close to Zhongyangmen long distance bus station. Zhonghuamen Station also known as Nanjing South is right next to Zhonghuamen metro and bus stations. It is smaller than Nanjing Station but from here you can access Nanjing and Huangshan (Yellow Mountain). The new Nanjing South Station is the main station for long-haul high-speed trains to Beijing, Shanghai, Xuzhou, Zhengzhou, Zhenjiang, Danyang, Changzhou, Wuxi, Suzhou, Kunshan, Jinan, Tianjin, Wuhan, Hefei, and beyond. Two 300 kilometer per hour high-speed rail lines connect Nanjing and Shanghai. It is a quick 4 hours from Shanghai and 75 minutes if traveling by fast train. A trip to Hefei takes around 1 hour, and Wuhan 3.5 to 4 hours. A ride to Beijing usually take 4 hours on a G-series bullet train. There are overnight buses that connect Nanjing with large hubs such as Beijing and Guangzhou. Zhongyangmen Station and Nanjing South Station are the 2 main hubs from which to arrive or depart for other destinations in the country via bus. It is also well connected with Shanghai, Hangzhou, and nearby provinces. Found right on the Yangtze River, Nanjing is well accessed by water. There are a number of boats that run between Shanghai and Nanjing, as well as northwards between Nanjing and Wuhan. You can also go to Hangzhou and Chongqing by boat. These methods may be more time consuming but the sceneries along the way make the journeys worth the effort. Although bus is the best way to get around many cities in China, this fact is a little less so in Nanjing. Buses run to most areas of the city that are inaccessible by its comprehensive subway system and are very affordable. It is best to bring exact change in order to take a bus. 3-figure route numbers follow indirect routes and run around quieter residential streets and are less handy for travelers, but can be interesting for cultural intake. Routes showing the Chinese character for “you” (travel) are primarily aimed at visitors and link all the major tourist sites. Routes that are 3 digits and begin with an 8 are night buses which run about twice an hour between 11pm and 2am. Buses with low-numbered routes (1-100) follow major roads and link major shopping, residential, and transportation hubs. Taxis can be found all around the city with rush hours being most difficult to hail one down from the street. All vehicles should be metered but keep an eyes on this in case of fraud. The metro of Nanjing is a proud point of the city. There are 2 main lines that well cover most main destinations. Line 1 runs from Maigaoqiao in the north, via the railway station and along the length of Zhongshan Lu through the city center to Andemen. In Andemen the line splits with alternate services going to the Olympic New Town area around the Olympic Sports Center and to the south towards China Pharmaceutical University via the new South High-Speed train station. Services between Maigaoqiao and Andemen run every 3 minutes, and every 6 minutes on each branch line. Line 2 runs from the new town area in the west and follows Hanzhong Lu and Zhongshan Donglu to the east, terminating nearby the Purple Mountain scenic area. Trains run every 6 to 8 minutes. There are interchanges to Line 1 at Yuantong and Xinjiekou stations. Expansion is in the plans. There are many bike lines to enjoy but always be alert regarding vehicular traffic which is often aggressive. Nanjing is a history and significant city in China with modern and ancient features to boast. It was the capital of China for 6 dynasties and through it all, visitors can now enjoy historical sites such as the Mausoleum of Dr. Sun Yat-sen, the Ming Tombs, Memorial Hall to the Victims in the Nanjing Massacre, and more. The Qin Huai River is a beautiful destination as well as the City Wall of Nanjing (the oldest in China), Confucius Temple, and The Gate of China (Zhonghuamen). 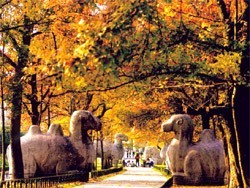 See the details of Top Attractions in Nanjing. Xinjiekou is the main shopping district in the city center similar to those found in Tokyo or New York City. You can find most of the top local, regional, national, and international brands here. Hunan Road is like Xinjiekou but on a smaller scale. Finally, be sure to do some shopping around the Confucius Temple market where you can find delightful clothing and artisanal items. Aqua City Shopping Center near Confucius Temple has many western brands and goods available. This large cite has properties that range from simple guesthouses to full service hotels and resorts. Most of the top rated hotels are in the Xinjiekou district, Nanjing’s commercial area. Budget options include Jasmine International Youth Hostel and Nanjing Danfeng International Hotel. For middle level accommodations, we recommend International Conference Hotel Nanjing, Nanjing Vogue Motel, and Nanjing&apos;s Yi Lai Celebrity City Hotel. Luxury options include Regalia Resort & Spa, Tangshan; Grand Metropark Hotel Nanjing, Sheraton Nanjing Kingsley Towers, and Kayumanis Nanjing Private Villa & Spa. Nanjing food is a smooth combination of regional and local flavors. Traditional Nanjing style is called Jiangsu cuisine based off the name of the province and is distinguished by its original flavor and fresh, raw ingredients. You will find your plates are often well orchestrated in terms of colors and presentation with only minimal seasoning and oil. This yields flavors that are mellow and subtle, suiting all palates. Some of the best places to try typical Jiangsu food are around Qinghua River and Hunan Road. There are countless street stalls that offer local favorites such as baozi (steamed buns stuffed with pork), bawei dawei doufunao (eight-flavored jellied bean curd pastries), roast beef, salty duck, animal stomach, chicken feet (also known as phoenix feet), xiaolongbao (delicate dumplings filled with soup and meat), tangbao (similar dumplings with crab meat and soup), and much more. Here is an ideal itinerary for 2-3 days in Nanjing. Feel free to contact us if our pre-arranged tours are not what you look for. Day 1: Arrive in Nanjing, visit the Mausoleum of Dr. Sun Yat-sen, the Ming Tombs, Confucious Temple night market, and Qinhuai River. Day 2: Visit the Yangtze River Bridge, Ming City Wall, Provincial Museum, and the Presidential Mansion. Depart later or stay one more night. Day 3: Leisure morning, depart Nanjing in the afternoon or evening.